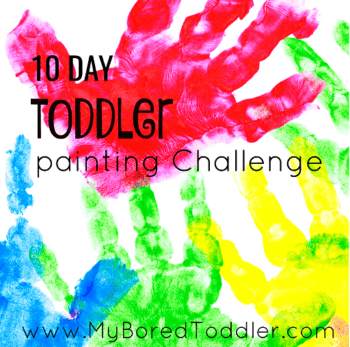 This post is part of our 10 Day Toddler Painting Challenge. If you would like to sign up you can join in HERE. 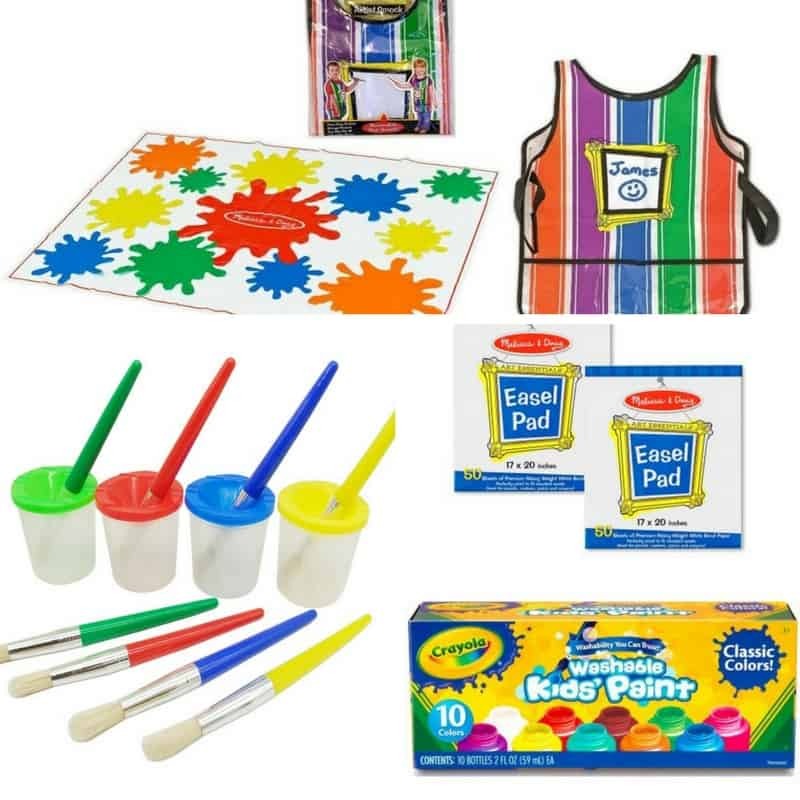 Before we get started with our challenge I’ve put together a list of basic items that you need to start painting with toddlers. 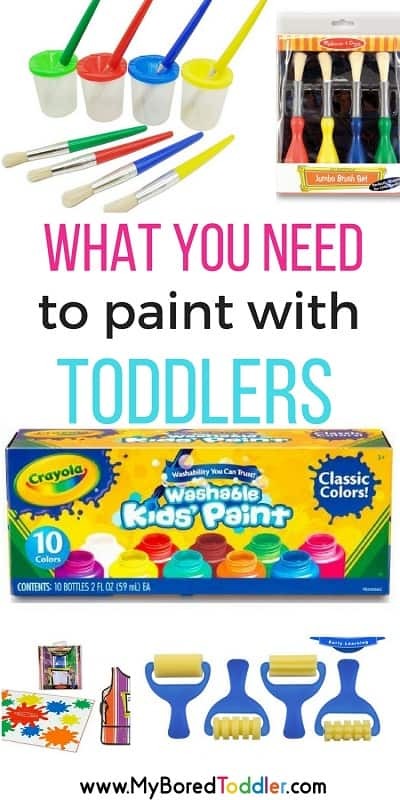 This list isn’t huge, it isn’t expensive, and these items will create a painting set that you can pull out any time your toddler wants to paint. If you’re like me you can go into a craft store or department store and spend a fortune on paints and craft items. The reality is that while these are nice, you really only need the basics to get started. As I talk about in my post ‘How to make a toddler craft box for under $50‘ you should start with the basics and then add other items when you need them or when they are on sale. To make it easier I’ve put everything that I mention in this Amazon List HERE so you can easily see the items I’m recommending. Most of these items should be available from your local craft and department stores too. Paint – this is an obvious one. Make sure you have washable poster paints (not acrylic) and they will wash off kids and most clothing. I like to use these ones from Crayola but most craft and department stores will sell similar ones and they should be inexpensive. If you are buying limited colors try to ensure that you have the primary colors of red, yellow and blue along with white. That way you can make up any other colors that you need. Paint brushes – if you are buying new ones then I recommend ones with a larger handle like these ones as they are perfect for little hands. It gives them a bigger area to grasp onto. A drop cloth – you can buy specific kids painting drop cloths like this one, but you really just need something to protect your floor! An old sheet or a cheap plastic tablecloth will also work. Paper – I like to keep a stock of white printer paper, an easel sized pad and a roll of butchers paper. For this challenge we will use the construction paper (use the back of old printer paper to save money) and the easel sized pad (you can substitute butcher’s paper for this so don’t feel that you need to go an buy both). Before you buy paper have a look around at home and see what you already have. Paint pots – I have to confess that I prefer to use paper plates to put my paint on so that you can throw them away afterwards. It makes cleaning up so much easier. If you do prefer paint pots these ones with a lid are perfect as they reduce (I won’t say prevent!) spills! These ones also work well for keeping water in. Water Container – You can use any cup you have or use the paint pots mentioned above. Wipes – for obvious reasons! Roller paintbrushes – you can get these quite cheap at most craft stores or even in the painting section at your hardware store. While it’s nice to have a mixed pack like this one for our challenge any type of roller will work. A Paint Smock – While you can buy ones like this one I actually prefer to put my child in an old tshirt of theirs (or even just a nappy if the weather is warm enough or you have good heating!). The smocks can be hard to get on and they generally annoy the child at this age. Find an old tshirt and make it your painting and craft shirt. It’s much easier! For the rest of the challenge I’ll be encouraging you to look around your house for items to use as using what you have is the aim of this challenge! If you still need to sign up to the challenge you can do that HERE. If you can’t wait for tomorrow’s email you can jump to tomorrow’s challenge HERE. The best FREE Youtube videos to get your toddler moving! Water Play Fun for Toddlers.